The 27th Annual Red Sarachek Invitational Basketball Tournament culminated in an edge-of-your-seats championship game on Monday, as Shalhevet High School’s Firehawks beat Valley Torah High School’s Wolfpack with 2.5 seconds left in overtime to take the tournament crown with a final score of 53-51. 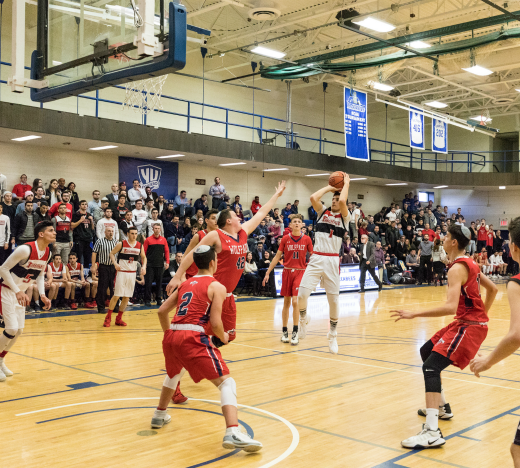 More than 20 yeshiva high school teams from across North America took part in the annual tournament—named for the legendary Bernard “Red” Sarachek, YU’s former longtime men’s basketball coach, and hosted by the Marsha Stern Talmudical Academy/Yeshiva University High School for Boys—from March 15-19. The tournament also included a lively Shabbaton and tours of the University’s campus to help the young all-stars gain an early appreciation for YU’s unique educational environment and provide opportunities for cross-school bonding off the court. This year’s Shabbaton program included presentations by renowned motivational speaker Gian Paul Gonzalez and Rabbi Lawrence Hajioff, a rabbi, educator, and writer, who is on the Judaic studies faculty of both Yeshiva College and Stern College for Women. Other participating schools for this year’s tournament included: Berman Hebrew Academy (Rockville, MD); Davis Renov Stahler Yeshiva High School (Woodmere, NY); Farber Hebrew Day School (Southfield, MI); Fuchs Mizrachi School (Beachwood, OH); Harkham GAON (Los Angeles, CA); Hebrew Academy (Miami Beach, FL); Hebrew Academy of Nassau County (Uniondale, NY); Ida Crown Jewish Academy (Skokie, IL); Katz Yeshiva High School (Boca Raton, FL); Kohelet Yeshiva High School (Merion Station, PA); Magen David Yeshiva High School (Brooklyn, NY); Robert M. Beren Academy (Houston, TX); SAR High School (Riverdale, NY); The Frisch School (Paramus, NJ); The Mesivta High School of Greater Philadelphia (Bala Cynwyd, Pennsylvania); Torah Academy of Bergen County (Teaneck, NJ); Yeshiva University High School of Los Angeles (Los Angeles, CA); and YUHSB (New York, NY). For complete tournament coverage, including scores, statistics, game summaries and awards, please visit www.macslive.com/sarachek.